It’s getting quite chilly here and I have been getting cozy in the evening and knitting. 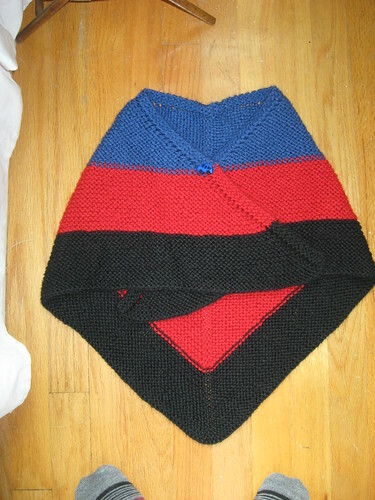 After the shawl i made for myself, Little Man asked me to make him one. Of course I said Yes. Notes: I improvised this myself. 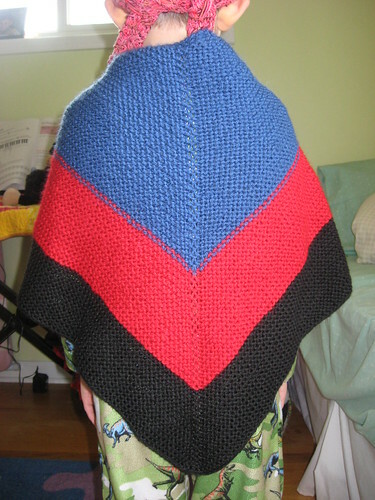 It’s just plain garter stitch. I used the cast on from the Kiri Shawl, yarn over increases on the left and right and I used the same center increases that my turquoise shawl used. So it’s kind of a modge podge of different patterns I have done. He was really excited when it was done and has worn it a few times. It’s nice and cozy and soft and has already been through a washing after chocolate ice cream got on it. I have been working on hubby’s socks. I have no more excuses not to work on them now that cooler weather is upon us. I also started some new socks for Socktober. It a Mystery Sock from the Through the Loops blog. I have a baby hat in the works and so close to being done! So you can expect to see that SOON! No more disappearances from me. What does the lunch lady do? I don’t have much contact with schools these days so I’m not sure, do you prepare lunches or maybe serve it to kids? 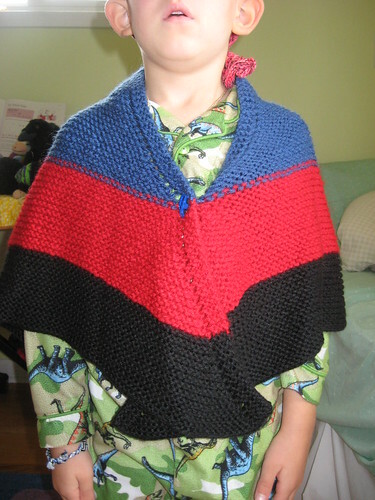 Little Man’s shawl is wonderful. I bet he loves to snuggle with it. 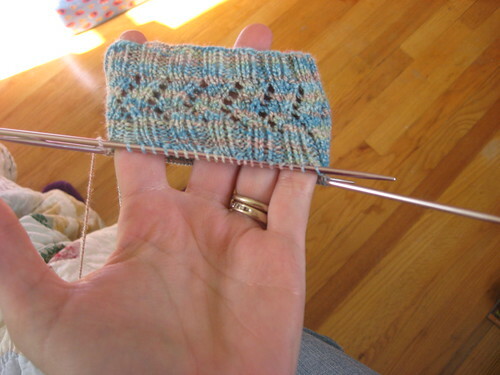 Your sock is coming along nicely. The colors are so pretty.